Use this app to copy the Exchange calendar into the new empty calendar in your Google account. 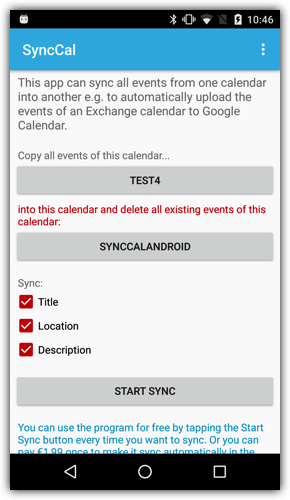 SyncCal can copy all events from one calendar into another and keep them synced. It will make the target calendar identical to the source calendar. I.e. it will ERASE all events in the target calendar and then copy all events from the source calendar into the target calendar, so that the target calendar contains the same events (currently only certain fields are copied, e.g. the title, location and description but not reminders and attendees). It can also automatically watch the source calendar for changes and make the same changes in the target calendar so that you don’t have to tap the "Start sync" button (the automatic sync is available as an in-app purchase and you can try it for free for one hour (even multiple times)).